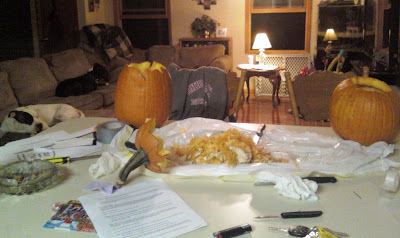 Neither Chad nor I have carved a pumpkin since we were kids, so we decided to this year. Here is our process part way through. The dogs seemed uninterested as they lounged on the couch. Spuds: Is this all we're gonna do tonight? Shadow: Seriously? That's all I can say...seriously? Here are the finished products. Me, a devil? Pshh, never! Spuds picked the costume. Something about it being his old one or something...I dunno becuz this is my first halloween here! P.S. Thanks for the votes!! I really appreciate it! 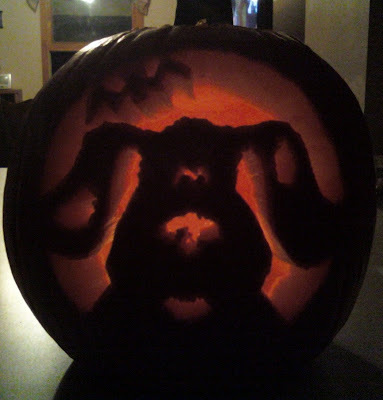 Adorable carving! And I love Shadow's costume. What a cyoootie. Ah, you found a costume for a bigger dog! 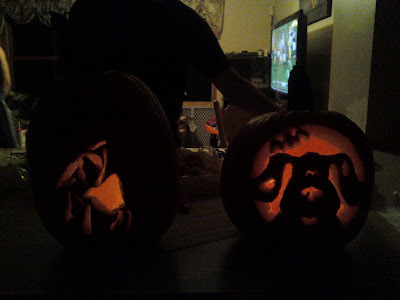 I always wanted to do a devil/angel combo for my dogs but never could find any costumes that fit. 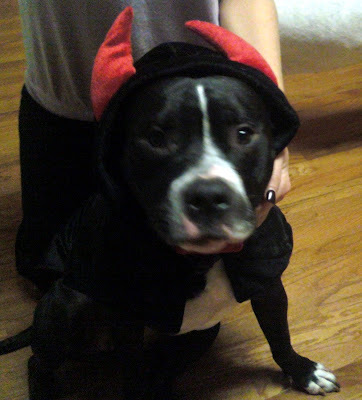 :/ Cute devil costume! @happypitbull: Yea! I think Target has bigger ones!